It’s hard to believe it has been over seventy days since I left everything and everyone I know for the adventure of a lifetime. It’s been a whirlwind from the start. I’ve had good days and bad days, just as I’ve had good food, and not so great food—at least to me. However, it is extremely difficult to find food you won’t like. When it comes to reminiscing on my time in Florence this past summer, I immediately look through my photos, as most people would. It is amazing to have these visual representations of my trip, and usually a few memories come flooding back. However, just having a photo does not tell you the whole story and some of the best experiences end up forgotten. This is why it is important to journal. Living in a homestay abroad is the best way to experience cultural and linguistic nuances and to cultivate intimate friendships with the natives of the city! As an Italian minor, I knew I wanted to live in a homestay to practice Italian. However, I also wanted to feel connected with the people of Florence. I live in the city center of Florence, Italy about a ten minute walk from the Duomo. As my second week in Florence comes to an end, I would like to reflect on the moments in which I have not been kind to myself since my arrival. “Two households, both alike in dignity, In fair Verona, where we lay our scene, From ancient grudge break to new mutiny, Where civil blood makes civil hands unclean. From forth the fatal loins of these two foes, A pair of star-cross’d lovers take their life. . .”, William Shakespeare, Romeo and Juliet. Looking to spend the most romantic weekend of the year in the perfect location? Well, then Verona is the place to go. I was very excited to take my first ever fashion design class as my major at school is more business geared and less creative design. I chose to take the Leather Technology class at FUA and it was by far one of the best decisions I have made. I have been living in Florence for a little over a week now. The whole time I have been here I have felt a rollercoaster of emotions; excitement, confusion, curiosity, and homesickness. All of these feelings are natural when moving to a new country and there is no advice I can tell you to avoid them. I have always been a homebody. I make a place for myself, and I become content staying in my zone for every activity. In order to gain personal growth, I thought it was time to do the complete opposite of my norm. I signed up to study abroad through SAI, and to live in Florence, Italy for a semester. Hello, Dear Reader. I understand you have come here for quality study abroad content. I am sure you have envisioned reading the grand tales of students exploring unfamiliar locations and experiencing unique cultures alien to your own. Well, Dear Reader you can look no further. Settle down and prepare your heart, for this tale you have stumbled across, this analysis of the Italian ecosystem is EXACTLY what you have been looking for. SAI caught up with SAI Ambassador Arianna, who answered some questions about her time in Florence. What was your favorite thing to do in your host city? I studied in Florence, Italy and there were so many things that I loved to do it’s hard to choose one. However, the first one that came to my mind after reading this question was simply walking around. Ever since I got on my six am flight back to America, I’ve missed Florence. The feeling of living in a city with so much history and culture is just absolutely unmatched. I find myself reminiscing frequently, going through my Snapchat memories and the hundreds of pictures on my phone, trying to keep the memory of Italy alive in me. If I had to sum up the last 10 days in one word it would be this: unconventional. You may perhaps deem it odd for me to describe the cradle of the Renaissance with such a word whose synonym is unusual, irregular, and uncustomary. Let me explain. I find myself sitting in the Oblate Cafeteria when my favorite song of all time starts playing in my earbuds. Passport, Visa, ID, Credit Cards and other miscellaneous (but extremely important) documents? CHECK. Now it’s a matter of getting from Point A to Point B. To survive life in a brand-new country, you must learn to walk before you can run. That means surviving the first week before worrying about the next few months. My roommates and I were lucky enough to be able to call the “local” side of Florence our home for the semester. As everyone described it to us, it was a little less touristy and more peaceful which can be a nice break from the hustle and bustle of downtown Florence. Walking back to a quiet neighborhood each day after class has truly been a blessing and I want more people to experience it. Alessandra, SAI Florence’s Program Coordinator, provides a colorful description of Tuscany’s “green gold,” otherwise known as “delicious, unforgettable olive oil.” In ancient times, olive oil was considered not only as food but much more valuable. It was also used to produce both medicines and cosmetics. Hippocrates called it “the great healer” while Homer called it “liquid gold. We caught up with Florence Assistant Program Coordinator Elizabeth, who highlights why you should choose Florence as a study abroad host city during the fall semester. There are many things to consider when choosing to study abroad so I’ve decided to shine light on some often overlooked things for you to consider before coming abroad. Drum roll… Let’s talk about seasons! Have you thought about which season you would like to experience abroad? These past few weeks have been a total blur. Final papers, exams, and preparing to leave Florence after an incredible semester certainly got the best of me sometimes. However, I walked around in absolute wonder the entire time because of the incredible holiday displays around the city. How could you not smile with such beauty and cheer surrounding you? Here are some photos of the Firenze festivity this holiday season. Happiness to you and yours! It’s about that time! I know that my last few posts have kind of felt like some sort of countdown to the end of the semester, and I guess in some way, that’s right. I liked keeping a good awareness of how much time I had left in Italy, just to make sure that I wasn’t letting the time slip me by. We caught up with SAI Ambassador Hannah, who reminisces on her time abroad from spring 2018. As I am approaching finals week at the University of Mississippi, I can’t help but reflect on my last semester in Florence, Italy. Specifically thinking of the difference between my SEC school, and Florence University of the Arts. I took 12 hours, which is four courses while abroad and I think it was the perfect amount. Studying in Florence is a series of amazing events happening day after day, but nothing is as special as when friends or family come to visit! Of course with such limited time you might not be able to fit everything in. Here is a guide to five of the best places to take your friends and family when they visit. Before I left for my semester abroad my home school warned me about the homesickness and culture shock, but to be honest I didn’t really believe them. I thought, “There’s no way this could happen to me.” Boy was I wrong. It is something everyone goes through while abroad, which is a good and bad thing. The bad part is you too will experience it. Ever since my senior year of high school, I knew that I absolutely, positively wanted to study abroad during college. Needless to say, my expectations were incredibly high coming into this. I think everyone sets their expectations high for a semester abroad because it’s a big idealized thing. Traveling the world, making new friends, experiencing life in a new country, and getting some fire Instagram pictures. It’s supposed to be absolutely perfect, right? Wrong. I want to give a little precursor to this post by saying I, in no way, mean that I’m special or an exception to any rule when I talk about my study abroad experience. Although, as someone who struggles with mental illness, I feel like I can provide a different take that can help prepare others for this time. We recently caught up with SAI Ambassador Katie, who talks about some of her favorite things to do in Florence. Florence offers individuals an abundance of heart and soul in every direction. From the famous museums, delicious food and hidden gems tucked away in each corner, there is truly something for everyone. Studying abroad is such a unique opportunity in the sense that you get to not just visit but live in a foreign city. We caught up with SAI Ambassador Sophia, who gives us a glimpse of what she ate in Florence. The word amazing can describe Florence in many ways. Amazing scenery. Amazing architecture. Amazing art. Amazing people. And my favorite, amazing food. There’s so much culture and perspective in Italian food to make trying it all the more rewarding. While abroad I did not eat out for every meal, because it would not be cost effective. We caught up with SAI Ambassador Sarah, who recently gave us a look at her time in the beautiful city of Florence. I studied abroad in Florence and it was the greatest decision I could have ever made. The beautiful cobblestone, magnificent churches, and the gorgeous Arno River, how could I not fall in love? There are so many amazing opportunities that you encounter as a study abroad student: meeting a multitude of new people, learning firsthand about a different culture, maybe even learning another language. However, one of the coolest opportunities, and perhaps the most important to take advantage of, is the ability to travel. One of the best parts about studying abroad is the opportunity to travel to so many new countries around you. The time you spend in your host city for the semester is so special, and nothing can really beat living life in Florence for a few months, but the weekend trips sure come close. One minute I was dozing off in the drone of Florentine traffic, and the next, I was awoken by gasps and awes. I slowly rose from my awkward slumped position of rest to join in with the group’s amazement. I looked out the window to see the thick woods of the mountain we were climbing, but in the breaks, there was a quick peek as to what was to come. 1. La Cite – Borgo S. Frediano, 20, 50124 Firenze FI One of the best places in Santo Spirito to just sit down and enjoy a book or get some homework done is La Cite. This cute little cafe doubles as a library! During the day you can enjoy a sandwich or a brownie with a cappuccino, but if you come back later you’ll see that the place has been turned into a quiet bar! Sometimes to really experience something fully, you just have to jump straight in. That was my thought process when I decided to sign up for the Cultural Introduction to Italy week-long intensive. This is a travel course through Florence University of the Arts that happens about one week before classes officially start in Florence. We arrived in Rome and travelled along the coast (for the most part) until we reached Florence on the final day. This month, SAI Florence Assistant Program Coordinator Elizabeth is contributing to our blog. Elizabeth highlights one of our student excursions to a Fiorentina soccer game. In March, SAI students were able to attend one of Fiorentina’s home games. This match was especially important, as it was the first one after the sudden passing of Fiorentina’s captain Davide Astori one week earlier. The stadium was sold-out and several homages were planned on the player’s behalf. The heat has passed, yet the bustling of a summer city continues. In fact, it is accentuated by the multi-locational jazz festival in the Oltrarno quarter. The Firenze Jazz Fringe Festival brought the best Italian and international jazz musicians to the city for four nights of incredible performances. The curators of this festival worked hard to emphasize the historical significance of the city as a stage. We recently caught up with SAI Ambassador Katie, who took some time to answer questions about her time in Florence. What was your favorite class abroad and why? I have never loved college courses as much as the ones I took at Florence University of the Arts. It is hard to choose a favorite when each class varied so much in its structure and personality. After seven months of preparation, it’s finally happening. I am here, abroad, in Florence, my now home away from home. It’s absolutely surreal, living around the corner from Piazza Santa Croce and walking to class past Il Duomo. Even constantly tripping on the uneven cobblestones and narrowly dodging speedy Vespas feels special. I’ve only been here for about two and a half weeks and I already feel at home. I have decided I’m going to use this blog post as an opportunity to be very real and honest. I am beyond grateful to be here and have this opportunity in Florence, however, this has been the most difficult transition of my life. These past two weeks have been very hard on me mentally and physically and it’s something that I want to bring attention to. We caught up with SAI Ambassador Courtney, who answers some questions about her time abroad. What was your favorite thing to do in your host city? My favorite thing to do in Florence was eating! The food was incredible and I tried so many new types of Italian cuisine. Every week I tried new restaurants with new friends which was a great way to get to know them over an exceptional meal. We caught up with SAI Ambassador Lillie, who talks about her summer in Florence. What did you learn about yourself when you were abroad? How have you changed? I grew up traveling with my family both in the U.S and abroad so before I left for Florence I just assumed my mindset throughout the term and just general attitudes would be the same as a vacation just with a couple classes added on…. We caught up with SAI Ambassador Mary Paige, who took some time to answer a few questions about her time in Florence. What advice do you have for new study abroad students? The best advice I have for new study abroad students would be to plan, plan, plan. Once you figure out your host city I would advise to do some research on local restaurants, shops, tourist attractions, etc. We connected with SAI Ambassador Madison, who took some time to answer some questions about her stay in Florence. What was your favorite class abroad and why? Florentine Art Walks with Dario. We spent the class period walking around Florence learning about the history around every corner. We went into churches and museums with our professor who told us stories and fun facts about where we were. We caught up with Ambassador Cecelia, who answers some questions about her time in Florence. What was your favorite class abroad and why? My favorite class abroad was “Florence Art Walks.” I expected this class to be going to the different museums in Florence and learning about the paintings and sculptures in each one. In reality, we literally walked all around Florence each week. We caught up with SAI Ambassador Jackie, who took some time to answer some questions about her time abroad. What is your favorite memory from studying abroad? It’s hard to pick just one moment, so I’ll pick my FIRST favorite moment. When my roommates and I went to Cinque Terre a few days after arriving in Florence. It was the first of many trips we took together. What is your favorite memory from studying abroad? I find this question to be the most common, yet the hardest to answer. My favorite memory isn’t made of one specific moment; it’s made of many. However, if I had to share one it would be coming back to Florence from my first weekend trip. Moving to a new place is difficult, moving to a new city in a new Country even more challenging. We caught up with SAI Ambassador Sophia, who reflects on her time in Florence. What is your favorite memory from studying abroad? While abroad I learned a lot about friendship. And one of my favorite memories was during the SAI farewell dinner. At the beginning of my experience I was nervous to attend events where I didn’t know the people, but overtime I grew a strong relationship with the group. We caught up with SAI Ambassador Katie, who reflects on her semester in Florence and her fun weekend travels. What travel tips would you give to someone studying abroad? Laugh it off when something goes wrong. It is inevitable that at some point something will go astray. It is so easy to get caught up in the ideal and how things “should have” gone. We caught up with SAI Ambassador, Sarah, who answers a question about her Marketing class in Florence. What was your favorite class while in Florence? Picking classes was easy when it came to my semester abroad because all of the Marketing classes sounded exciting! My favorite class abroad was International Marketing. Our three-person group assignment was to pick a country around the world and market a product of our own creation. We caught up with SAI Ambassador Alex, who reflects on her summer in Florence. What was your favorite thing to do in your host city? My roommate and I would go on late night walks around Florence to reach our daily step goals (which were over 10 miles!). I loved these walks because were we able to just wander with nowhere to be. We caught up with SAI Ambassador Danielle, who answered some questions about her time in her bella Italia. What was your favorite class abroad and why? Growing up in an Italian American household I learned a lot about my family’s Italian heritage and traditions. When I finally made it to Italy, I wanted to learn more about what it truly means to be Italian. SAI caught up with student Ambassador Sara, who answered a Q&A about her time in Florence. What is your favorite memory from studying abroad? My favorite memory is from the day I spent with my friends in Positano. We were so exhausted from a long bus ride and slept for only two hours. But, once we got going the next day, we had the most relaxing time on the black sand beaches. We touched base with SAI Ambassador Madison, who reminisces about her time abroad. What did you learn about yourself when you were abroad? How have you changed? Studying abroad is always something that I wanted to do but I never thought it would have this much of an impact on my life. While I was abroad I gained many self-dependent skills throughout my various adventures. We recently caught up with SAI Ambassador Francesca, who reflects on her summer in Florence. My favorite memory from studying abroad would have to be hiking up to the Piazza Michelangelo with all my roommates. We would hike up with Pino’s and eat our dinner watching the sunset. We recently caught up with SAI Ambassador Camille, who reminisces on her time in Florence. While I was abroad in Florence, Italy, I almost did not realize how much my life was changing. It did not happen in one day. Over the course of the semester, I found that I thought about myself and the world differently. SAI recently caught up with Ambassador Bryce, who took some time to answer questions about his time in Florence. Studying abroad taught me so many things about myself. First, I learned that I had the ability to independently travel to a foreign country, learn the culture, and immerse myself in a whole new environment. We caught up with SAI Ambassador Elizabeth, who reflects on some great memories from her semester in Florence. Study abroad was not just visiting new places and living in another country, but believe it or not studying. One class that made my experience more special was one called Florence Sketchbook. I had always loved art and drawing so I figured an entire class about sketching would greatly help my artistic abilities. SAI Ambassador Tara shares her story about how she progressed from a novice to seasoned traveller. For some of us, going on vacation with family means going to the airport and following our parents to different terminals, trams and check-points. We get in taxis and mindlessly make our way to hotels. SAI caught up with SAI Ambassador Hanna, who answered some questions about her time in Florence. What was your favorite class abroad and why? While abroad, I took four classes. They were all related to my major (marketing and communications) or my minor (art history). My favorite class was Florentine Art Walks. Once a week we would meet up and walk around the city for two and a half hours. SAI caught up with SAI Ambassador Lauren, who answered a short Q&A about her time abroad! What is your favorite memory from studying abroad? I completely fell in love with the city of Florence and cannot wait to go back. One of my all time favorite memories from studying abroad was one of the smaller moments there. SAI caught up with SAI Ambassador Katie, who explains how studying abroad helped shape her future career goals. Studying abroad has already opened up new doors and possibilities regarding career goals. In my decision to study abroad, my main goal and mindset was centered around the purpose of growing as a person. I intended to break out of my comfort zone and branch out. We recently caught up with SAI Ambassador Kristen, who answers some questions about her time in Florence. What was your favorite class abroad and why? My favorite class I took abroad was my Wine Marketing class. I took it at the beginning of my semester every day for three weeks straight. It was a great way to be introduced to the Italian wine culture. Camille is an SAI Ambassador who was selected to intern at SAI’s headquarters in Sonoma County, California for the summer. We got in touch with former SAI ambassador Caleb Crum, a Missouri State University alum who studied abroad with SAI during the spring of 2014 at Florence University of the Arts. Caleb is now the founder of a blog called Goingabroadtips and now works as a travel planner! Needless to say, studying abroad was an important part of his life and guided him choose to work in the travel industry. SAI recently caught up with with SAI Ambassador Emily, who answers some questions about her time in Florence. What was your favorite thing to do in your host city? My favorite thing about my host city was finding the local spots. Tourist traps can be easy to fall into. While you definitely want to explore everything that TripAdvisor may suggest, you’re there for four months. What was your favorite class abroad and why? My favorite class abroad was my modern art history class with Professor Lucia Giardino. She began a modern art class to allow another option of art history to be available to students and it was my favorite class while abroad. Many come to Florence to see the Renaissance art that is evident throughout the city but there is also a modern art scene in Florence as well. Hey everyone! My name is Cameron Cipolla and I studied abroad in Florence, Italy last Fall of 2017. I am now going into my senior year at Belmont University where I study commercial voice. For those wondering, commercial voice really just means I am a vocalist who sings contemporary music, and yes that is actually a real major. We recently caught up with SAI Ambassador Kinsey Kelly, who answers some fun questions about her summer in Florence. What does your study abroad experience mean to you? My study abroad experience means a great deal to me because it gave me the opportunity to learn and indulge in a completely foreign country. I absolutely loved throwing myself into the Italian lifestyle and encountering traditions from their culture. SAI recently chatted with SAI Ambassador Lauren, who reflected on her memories in Florence. What was your favorite thing to do in your host city? My favorite thing to do in Florence was to stop and listen to what was going on around me. Sometimes I would find myself getting so caught up in plans and activities that I would forget that the first of my favorites was the sound of the streets. We recently caught up with SAI Ambassador Gwen, who shared with us her memories on her time in Florence. What was your favorite class abroad? While studying abroad at Florence University of the Arts I had the opportunity to take Travel Writing; a weekly class that encouraged travel and diary style writing about my personal experiences abroad. As a creative writing minor, this course was an absolute dream for me. What did you learn about yourself when you were abroad? How have you changed?I was very nervous about studying abroad. I found myself very comfortable at school and was hesitant to leave the college environment. I did not want to miss out on any school activities and leave my friends to go to a foreign country. Recently we caught up with SAI Ambassador Angelika, who studied abroad in Florence during the spring 2018 semester. In this blog entry, she answers some questions describing her time in Florence. • What was your favorite thing to do in your host city? I studied abroad in Florence, Italy. While there are so many things I can talk about that were my favorite, one activity that will never get old is hiking up to Piazzale Michelangelo. Recently we caught up with SAI Ambassador Grace, who studied abroad in Florence during the spring 2018 semester. In this blog entry, she answers some questions describing her time in Florence. 1. What felt the most “foreign” to you when you came back to the U.S? The toilets in Europe you push the top of them to make them flush. I really can’t believe it’s the end. What turned out to be one of the most rewarding and at the same time challenging four months is all behind and I’m finally going home. I’m so excited, in a few short days I will be able to hug my family and friends back home, something that I’ve missed so much. To write about my entire experience is simply impossible because every day was different. Recently we caught up with SAI Ambassador Holly, who studied abroad in Florence during the Fall 2017 semester. In this blog entry, she answers some questions describing her time in Florence. 1. What was your favorite thing to do in your host city? One of my favorite things to do was to just walk around the city and explore new areas. Even in a small city such as Florence there is so much to discover. 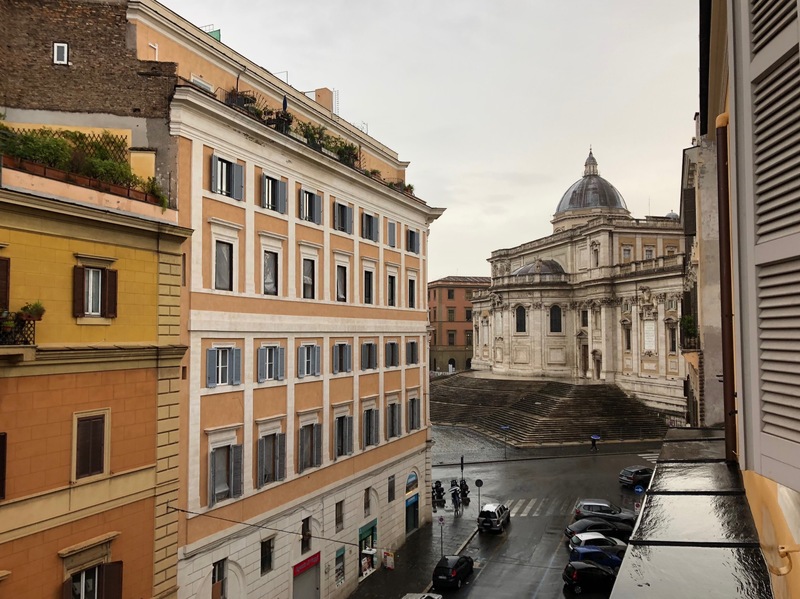 Before arriving in Italy, like any eager student who has never once stepped foot outside of the United States, I had brainstormed what exactly I wanted to get out of my study abroad experience: what I wanted to learn, what I wanted to see, what I wanted to eat! We handed over our Instagram account to Kristin for the day. This is her day in Florence. Ciao everyone! My name is Kristin @kristinhiemstra and I am studying abroad in Florence, Italy at Florence University of the Arts! I am a student from @coloradostateuniversity studying Health and Exercise Science, but here in Florence I am studying History and Photography! Today I’m going to give you a glimpse into my life abroad…hope you enjoy! As our final days in Florence approached, my roommates and I couldn’t help but constantly reminisce on all the memories we shared and the crazy ups and downs we experienced in this beautiful country we can now call home. With the stress of finals and packing our lives up we had remembered our silly bucket list that we made in the beginning of the semester. My time is Florence has come to an end. It seems like just yesterday I was stepping off the plane to be greeted by the wonderful SAI staff. These past few months have flown by but they were filled with wonderful memories that I will cherish forever. Studying abroad is a great opportunity to learn more about yourself and the world you’re living in. You get put into situations you haven’t experienced before. Tuscan Farm Adventures: An SAI Excursion! One of the many perks that come along with studying abroad through SAI are the opportunities for students to go on amazing day trips for free (after a 10€ deposit that you get back on the trip)! This semester I went on trips to thermal baths, a Fiorentina calcio (soccer) match, and historical cities surrounding Florence such as Lucca, San Gimangiano and Prato. I am not sure where I am going, so let’s get into this and hopefully, we can both come to the end having learned something. This mantra aforementioned is how I try to go about every new situation and I think this mindset can benefit many. Confidence is the ability to be sure of oneself or prospects and embrace the uncomfortable. We handed over our Instagram account to Lauren for the day. This is her day in Florence. Ciao! My name is Lauren Roderigues and I am studying abroad in the Bella Firenze, Italy at Florence University of the Arts. I am a student from @emmanuelcollege in Boston studying Graphic Design. Here in Florence I am studying ceramics, photography, exhibition curating and illustration and book publishing. As one of this years scholarship recipients I was asked to complete ten hours of community service in Florence. This was a great opportunity for me to engage with locals and give back to the city that his given so much to me! Where I decided to dedicate my time volunteering came about in an interesting way. We handed over our Instagram account to Caroline for the day. This is her day in Florence! Ciao! My name is Caroline, I am from Florida, I am a photography major at The University of Central Florida, studying at FUA in Florence, Italy this spring semester! I’ll be taking over the handle today to show you what a typical day is like for me in Florence! My study abroad program is located in Florence Italy. I live in the city center but in a primarily residential area. Near me are markets, restaurants, and even a church. I have gone as far to explore the other side of the river which is the Arno river. Florence is a historic city. Various pushes in fashion began there and then there is the Duomo. We handed over our Instagram account to Willa for the day. This is her day in Florence. Ciao! My name is Willa, I’m from NYC and I’m a junior at University of Wisconsin-Madison studying at Florence University of the Arts this semester. Today, I’m taking over the SAI instagram to show you a typical day in Florence! I am going to be discussing the many exciting opportunities that I have been a part of while being in school at FUA. I am taking a Contemporary Art class with Lucia Giardino and it has been a fantastic experience so far. She has taken us to so many different museums and sites that it makes the course fees for the class so worth it. My SAI moment happened as soon as I landed in Florence. Here I was in a foreign country, alone, my Italian phone wasn’t working yet, my luggage got left behind at my connection in Paris, and I was so lost on what to even do. I didn’t follow the number one travel rule that says “always pack your tooth brush and an extra change of clothes in your carry on. Two SAI Florence alumni, Holly and Julia, recently reunited in Chicago. The two close friends submitted a blog post on how they met while studying abroad in Florence. Ciao! The first day we met each other was in our small apartment on Via San Gallo. Soon after that, we started planning trips together and getting to know the beautiful city of Firenze. Coffee…a staple to the Italian diet and a habit that, when first arriving in Florence, I was unsure I would be able to manage. I have quite the sweet tooth and with a typical order at Dunkin Donuts including a high percentage of flavored syrup, I did not know if I would be able to enjoy the simple, heavy on espresso drinks made at Italian coffee bars. I arrived abroad a week early in Rome for a class called “Cultural Introduction to Italy,” arranged through SAI and my school, Florence University of the Arts. It was a course that promised three credits in only one week, with a schedule listed on the syllabus from 8 am to 8 pm—a little daunting at first…I mean what could we possibly be doing ALL day long? Living in Italy for the last few months has been surreal, but coming from a Florida beach town I’ve begun to miss the warmth and sun, as the last few weeks in Florence have been filled with rain. My roommate had been toying with the idea of visiting the south of France so I curiously looked up train tickets and was surprised at how affordable they were. Before I left for Florence, I had the daunting task of packing for six weeks. I’m a fashion major, so clothes are how I express myself. I had no idea what clothes I needed to pack, and I couldn’t find much on the internet about what the locals wore. I heard somewhere that shorts are a very American thing to wear, so I decided to only pack a few pairs of shorts. Throughout my time in Florence thus far, I have experienced a little bit of every kind of weather including sunshine, rain, sleet, and even snow for the first time in years. Dealing with the amount of rain and strange weather we have had here lately can be frustrating if your plans include things like going to the beautiful Piazzale Michelangelo, walking along the river, or visiting the stunning Boboli Gardens. Making the transition from living in one country to another is probably one the biggest test of character a person can go through. It can bring a myriad of emotion, ranging from anxiety, confusion, curiosity, to excitement. Just remember, that with the right mindset, anything is achievable. Once you have gotten through your first week, you have made it! One of the unique things that SAI offers in Florence is the chance to learn how to cook like a true Italian, through free cooking classes. The first class I took was on Valentine’s Day and allowed me to spend the day with my first love, pizza. Taking an Italian cooking class is probably on a lot of peoples’ bucket lists for when they visit Florence or other parts of Italy. It was certainly on mine, so I was eager when I saw that SAI offered them so frequently. At home and at my school in the U.S, I cook nearly all my meals and get excited about making new recipes with my roommates. Making my way through the past three weeks here in beautiful Florence has been a dream and stumbling upon some really cool places has made my experience even better. In hope that your experience studying abroad is amazing, here are my top four must-see and must-eat at places and spots around the city of Firenze. Number one would have to be this secret rose garden that is located halfway up the steps to Piazzale Michelangelo. As amazing as it is to be able to effortlessly relocate to a new European city or country for the weekend, I’m sure many can relate to the stress that comes with having to fit all the excitement and activities of a city into one short weekend – especially when we only have one full day. Leaving to study abroad was one of the scariest things I have ever done. Studying abroad in a new country seemed like a dream that would never become true. Reality did not begin to set in that I was leaving until my bags were packed and I said my goodbyes. Even in the airport I still did not feel like I was leaving America for a full semester. Its been a little over 3 weeks since I made my journey across the Atlantic Ocean. While Florence is starting to feel a bit familiar, the last couple of weeks felt like a big roller coaster as I attempted to adjust to a city completely different than the ones I’ve lived in before. Traveling is something that many study abroad students chose to partake in. While country hopping every other weekend sounds enticing, the cost can add up quickly. From friends and acquaintances that have studied abroad in the past, I have found that many wished that they had spent more time in their host county rather than traveling to a new country at every possibility. France, Germany, Switzerland, and all the other amazing countries in Europe are all closer than they have ever been before and seem more appealing than ever before knowing most are just a quick train or plane ride away! My first week in Florence was one of the greatest weeks of my life but, it did not come without it’s challenges. Here are a few things that I learned. Every Day is Leg Day It was around one in the afternoon when I was dropped off at the front of my apartment with my two suitcases and large carry-on in hand. For those of you just starting the adventure of your life, and those of you currently settling in abroad, this is for you. I was in your shoes one year ago today, and I could not handle the anticipation for what was to come. I shortly learned that not everyone’s abroad experience is the same, and that is okay. “Name one thing you wish you had known before studying abroad and one thing you’ve learned since you’ve been here.” My friend, Alec, proposed we all go around in a circle and share our responses to this question. As the only girl in a group of four traveling to Paris, Copenhagen, and Amsterdam for nine days, I thought I would be the sentimental one. Florence is known for all of its’ churches, museums, and all of the amazing Renaissance art. When we think of Florence, we think of Michelangelo’s David in the Galleria dell’Accademia. We think of Botticelli’s Primavera and The Birth of Venus inside of the Uffizi Gallery. Every tourist goes to see the Brunelleschi’s Duomo and Ghiberti’s Baptistry Door. Were you gifted a journal before studying abroad? Well.. I will break the news to you now and say that you probably won’t write in everyday like you’re hoping and planning. I am an SAI Ambassador who went to Italy with high hopes that I would avidly journal, but if you’re not in the habit of doing so already it will quickly get put on the back burner. 1. Explore Your City When I feel homesick I often stay inside of my apartment and watch Netflix all day. It took me a couple of days to realize that in a way, doing this made me feel even more sad! I would force myself to leave and explore the city. I would walk down streets that I had not seen before to try to find new shops and restaurants. The study abroad blues are real and though an unforgettable experience, it is an experience for many that leaves you missing your second home. Study abroad alumni- there are many, but just like a snowflake, not a single experience can be replicated. Going into the adventure and roller coaster called studying abroad, you can never be fully prepared, in fact you are guaranteed to be unprepared. One of Tuscany’s most traditional dishes is the Ribollita soup. This soup is very popular after the wine harvest is done and autumn is in full swing. Ribollita is made of bread, beans, and vegetables of course. Due to the fact that Tuscans do not have a rich culinary history in their pasta dishes, but they are known as “mangiafagioli” all over Italy. Mangiafagioli means “bean-eaters. As my last few days in Florence came to an end, I found myself feeling two polar opposite emotions. Half of me felt more than ready to get home back to the United States where I would be reunited with my family and friends, no longer worry about not knowing how to speak the language and indulge in all the American food I had been missing. But the other half was very, very sad. Today was my last day in Florence; this entire experience seems almost unreal to me. It feels like I was struggling to drag my luggage up the stairs to my apartment just yesterday. This city has come to feel like home to me. Of course it does not replace the city where my family lives, but Florence will definitely always have a piece of my heart. We have a few new things coming in summer 2018! Travel all of Italy with our new SUMMER C Program: Want to get the most out of your summer abroad? We combined our Summer II and III programs to create a new 6 week summer program, which includes three weeks of traveling throughout Italy before you end in Florence for a three week program. Celebrating a holiday abroad has been one of my favorite parts of my abroad experience. It is difficult because I miss celebrating with my family and friends from home, but getting my new friends from school to celebrate with me really helps. I celebrated Halloween and my twenty-first birthday while abroad so far and plan on having Friendsgiving with my group of friends from SAI. Traveling on the SAI trips with entire groups of other study abroad students and people who actually know their way around the places we are visiting is great. I have been on amazing trips with SAI, however, my favorite experiences have been when I have traveled on my own or with a few of my friends. Planning trips on my own or with my roommates has been an interesting experience. Thinking back on the first day I arrived in Florence feels like it could have been yesterday. The eagerness to arrive, the overwhelming excitement, the jet-lag and excruciating heat all come flooding back. At that point, it felt like I had endless amounts of time in the city of my dreams. 1. Learn the language before you come. You don’t have to be a pro! However learning phrases or words just to get by is really nice to know. It comes in handy when you’re trying to meet locals, or ordering at a restaurant. Mostly everyone in Florence knows English, but there are those few that don’t, so just learn some words! 2. You don’t need to pack your whole closet! For a long time I have tied success and passion to speed and persistence. The bustling city streets I’ve walked in my youth reinforced my value for unyielding movement—of my feet, my eyes, and my mind. “Walk with a purpose” is a common, a likely overused, motto of mine. From Point A to Point B, from one class to the next, from one event to another, move with the fire and light of the city. I don’t think I realized how much I love spending Thanksgiving with my family until that wasn’t an option. To me, the day has always been about eating good food and catching up with relatives I hadn’t seen in awhile, but it was nothing special. Thanksgiving was the first time I got homesick this semester, but also the day (or week, really) during which I most appreciated my experience in Florence. Florence is a city which prides itself on its rich cultural history, particularly that of the Renaissance. Art flourished in Florence, yielding countless iconic works which draw crowds of visitors every year. Among these great works are several versions of the Biblical hero David, who came to represent Florence because of his ability to overcome seemingly impossible enemies through faith, dedication, and cleverness. Even now, Davids appear in piazzas, courtyards, and postcards across the city. Apicius Career Programs: what are they & are they right for you? Do you like the idea of living in Florence, inarguably one of Italy’s foremost centers of cuisine, wine and hospitality? Do you like the idea of enrolling in a program focused on culinary arts, hospitality management, Italian baking and pastry or wine studies? If this sounds amazing, then perhaps enrolling in an Apicius Career Program might be a good option for you. Upon getting the approval from both my parents and SAI that I was admitted into Florence University of the Arts, I spent the rest of the semester at home fantasizing about what it would actually be like, walking down the cobble stone paths to class with views of the Duomo. I believe that one of the most enriching experiences that I have had abroad thus far has been in my Italian Food, Culture, and Society class. I encourage anyone who goes abroad to see what classes the university offers in order to really learn about the culture in which you are living. My class has been about the way Italians interact, eat, and their history. I grew up on the west coast, moving from California to Idaho, then back, then back again, and for the past two years I have been attending university all the way across the country in Washington, D.C. I’m no stranger to homesickness, to missing old haunts and familiar faces. My Top 10 List While Studying Abroad 1. Visit the Amalfi Coast in Italy Whether it is just for the day or for a weekend get-away, the Amalfi Coast is a sight worth seeing. The coast is lined with stunning Italian homes that reach the tops of the mountains. Not to mention the seafood is fresh from the ocean and tastes amazing. While studying in Florence, it is so important to travel every where you possibly can! There are cheap airlines such as Air Dolomiti, RyanAir, and Air France. Honestly, what I have found to be the best ways to travel is by train. The trains in Europe are much different than the ones in the United States. They are super comfortable and clean. Looking at Italo, Trainline, Eurail, and ItaliaRail are great trains to travel on. The classes I am taking in Florence are similar yet completely different from the classes I was taking back home in Virginia. The biggest difference that has caused me to enjoy my classes abroad is how hands-on the work is. The information I have learned thus far is relevant to my major and applicable in real life situations. Confessions from a professional student: I’ve been feeling stuck. Wedged between the standards of a collegiate education and personal expectations for the pursuit of knowledge, I haven’t been able to get out of my own way. Bury me in books, lock me in a room with a pen, shake me with science, and break my preconceptions with art—that’s what I would say. Take the trip, embrace the un-comfortability, enjoy the bewilderment-study abroad! Studying abroad may have been the most difficult thing I have ever done. 21 years of figuring life out, myself out and now a new culture is an incredible adventure. To step away from all that is familiar, to acknowledge that you will get lost mentally, emotionally and physically but that it will grow you in ways you could never imagine is daunting. My SAI moment was the moment I stopped leaving Florence! We asked SAI alumna Jessica to tell us about her SAI Moment, a defining moment in her study abroad experience. My SAI moment was the moment I stopped leaving Florence! When I arrived in Florence, I was shocked to learn that my peers had been planning trips long before the semester began. I felt like I was rushed to schedule trips to other countries, so I did. As I am reflecting on my “fairy-tale” semester studying abroad in Florence, Italy it is challenging for me to pinpoint my favorite moment or experience. There are just too many to choose from! I guess that isn’t a bad thing right? But, if I had to pick my most special moment from my semester abroad, it would definitely be the opportunity I had to see the world. From the moment I entered this world, I let my parents know that their daughter had been graced with a very large appetite. Like a baby bird, my eyes stayed wide and my mouth open, hungry for food of the brain and the stomach. My appetite for life remains and the nickname “Bird” stuck around too. If you think being gluten-free in Italy is impossible, you are wrong; if you think it is a struggle, you are wrong; & if you think you will starve for four months, you are wrong! Due to health reasons, I am gluten free. So coming to Italy to study abroad raised some concerns of what I would be able to eat. About a year ago from today marked the start of my study abroad adventure. This time last year, I officially decided to study abroad at SAI Florence University of Arts. I was filled with mixed emotions such as excitement and apprehension. I heard endless amount of times from family and friends that studying abroad was going to be “the semester of a lifetime. Oh the places you’ll go… and eat! Here is a list of some of my favorite places to eat in Florence: Caffe Firenze — This place has the best croissants in Firenze! I get a caffé latte and the croissant and it is only about 3 euro. The people who work there offer great customer service, too. Deciding to spend the first semester of my junior year in Florence, Italy was definitely one of the best decisions I have ever made. Although I have been here barely more than two weeks, I can tell that I am already learning and maturing immensely. I have thoroughly enjoyed all of the challenges and difficulties I have faced thus far. This semester abroad is my very first time traveling outside of the United States. Studying abroad in a foreign country didn’t really seem like a big deal to me. I’ve moved plenty of places on my own for summer internships like New York City and Milwaukee – I came to Europe on a school trip in the 10th grade. We got in touch with SAI alumna Kristen Martin, who studied abroad with SAI in Florence in Fall 2016, to ask her about her experience and her life now. What have you done since studying abroad? I graduated from the University of South Carolina in December and then a month later I moved to Dallas, Texas to start my dream job! I work at Neiman Marcus as an assistant buyer in the beauty division. We got in touch with SAI alumnus Patrick Sutton, who studied abroad with SAI Florence in Spring 2012, to ask him about his experience and his life now. What have you done since studying abroad? A few days after returning home from Florence, I started an internship at Paragon PR, a financial communications firm in Westfield, NJ (now headquartered in Hoboken, with an office in London). We got in touch with SAI alumnus Bryce Casper, who studied abroad with SAI Florence in Spring 2012, to ask him about his experience and his life now. What have you done since studying abroad? Studying abroad in Italy made me fall in love with travel more than I could have ever imagined. I would like to share ten things that I learned while studying abroad: 1) Plan ahead – this is for the clothing of what to wear in a foreign country with cultural meaning, weather etc. Also, this can be for when traveling around and checking times of monuments, how much money to bring, etc. 2) Get some familiarity with the language of the host country before arriving. The perfect summer day in Florence would definitely be to start your morning, before it gets too hot, on a walk around the Duomo. To just sit with a cappuccino and croissant and watch the tourists and locals interact around such an amazing building. Then, I would go to All’Antico Vinaio for an amazing, well-spent 5 Euro panini! Before leaving for Florence, every single one of my friends who went abroad told me that I was about to embark on the most exciting and eye-opening experience of my life and naturally I came in with very high expectations. My first week in Florence has already been one of the most eventful and life-changing weeks of my life. I find it so hard to believe I have only been here for a week! It seems like it’s been much longer because there are always so many different things to do during the day and at night. When I arrived in Florence and seen where I lived, I was blown away. I couldn’t believe how nice and spacious the apartment was. There are three bedrooms and I have my own room. There is also a full kitchen, dining room and living room. I was expecting us all to be crammed into a tiny apartment! I decided to use Spring Break as the perfect opportunity to pig out and try new foods from each destination that I traveled to in Portugal and Spain. The first restaurant that we dined at during our travels was located in Lisbon. If you didn’t already know these countries are somewhat known for their seafood and aquatic dishes, so my friends and I came here with the intention of grabbing some at every destination. If you asked me a year ago from now if I ever saw myself living in a foreign country for an entire semester, away from everything I know and that is comfortable to me, I may have looked at you as if you were crazy. Little did I know that when I took the leap of faith to study abroad in Florence, Italy, that I was making the best decision of my entire life. Italians love their coffee, and each person likes it in their own particular way. There are probably hundreds of different ways to order coffee here. All coffee drinks in Italy consist more or less of simple ingredients: espresso and milk. The True Classics: un caffè: single shot of espresso. Being abroad has been the experience of a lifetime, but nothing has been better than the friends I have met along the way and the friendships I will now hold for a lifetime. Fashion Loves You (FLY) is a boutique inside the school of Fashion and Accessory Studies and Technology (FAST) at FUA. It is a vintage store that also sells emerging designers’ work as well as students’ work. The latest FLY Event featured BeGiuls, an emerging fashion designer located in Florence, a live photo shoot, a gourmet aperitivo and a special exhibition of the garments created in Florence University of the Arts’ Apparel Design class. After living in Florence for a little over 2 months I’ve come to really appreciate everything that it has to offer, especially the small not well known secrets of the city. To begin with, we will start with the panino topic. After traveling to other Italian cities I’ve noticed that no other place has panini like Florence, it’s one of their specialties! These are my 10 Reasons why Florence is the Best Place to Study Abroad: Best gelato It’s no surprise that Florence has the best gelato in Italy (and in Europe), considering the fact that it was invented in Florence! I think that this is on the top three things of what I’m going to miss the most about Florence. My last blog post talked about some of the ins and outs of my overall study abroad experience, since my time to go home was quickly approaching. Fast-forward, I have been home for just over a week now, and personally, it is crazy to think that I spent the last three months living in Europe. In all honesty, it almost feels like it didn’t happen! For the spring semester in Florence, I was given the opportunity to intern at FLY. FLY, which stands for fashion loves you, is a non-profit clothing store ran an operated by the students and faculty in the Fashion and Accessories Studies and Technology programs at Florence University of the Arts. As I become more and more familiar with my surroundings around Florence, I have found some amazing cafés, restaurants, and gelaterias that I feel are an absolute must for abroad students to try in their time here. Of course there are still so many hidden places I need to hunt down, but so far here are 10 of my favorite go-to places I have found in my time here! 1. “Two roads diverged in a yellow wood, and I – I took the one less traveled by, and that has made all the difference.” This popular quote by Robert Frost has inspired many to go off the beaten path and see what treasures they may find. As studying abroad becomes increasingly popular with university students, I find it imperative to maintain the original purpose behind the experience. We handed over our Instagram account to Lily for the day. This is her day in Florence. Hey peeps it’s Lily Herring from Florence University of the Arts in Florence, Italy comin’ at you today with an Instagram takeover of SAIprograms for an inside look into the day to day life of a study abroad student. This weekend I had the amazing opportunity to visit the Amalfi coast and explore the towns of Positano, Capri, Anacapri, and Pompeii. I have to say I was not too excited to begin with because my good friend could no longer make the trip with me so I had to venture solo. One aspect that made my Study Abroad Experience so unique and special was when my family came to visit me during Spring Break. A break from classes, and reuniting with my family was much needed, as I was beginning to feel the effects of homesickness and that middle of the semester slump we all know so well. Every year on Easter Sunday, Florence explodes (literally) in celebration, and it’s not to be missed. The Scoppio del Carro, or Explosion of the Cart, is a tradition dating back over 350 years that attracts large crowds to the Piazza del Duomo in downtown Florence. Presento i Miei Amici Fiore e Alessio! The very first night in Florence, my roommate Emma and I decided to go out and experience the exciting nightlife the city has to offer. Little did we know we were going to meet a few locals who are now two of our really good friends. At one of the more well known clubs, Space, my roommate, Emma, and I were approached on the dance floor by two gentlemen who began speaking Italiano to us. While by no means exhaustive, the following list is a compilation of lessons learned and tips I would give for a semester abroad: 1. (And therefore the most important) You can never have too much gelato. Stressful test? Get some gelato. You walked a long way and are hot and tired? Get some gelato. Meeting up with friends? Get some gelato. Just passed a good-looking gelateria? Get some gelato. My time abroad in Florence has been incredible thus far and I have loved documenting my travels, but for this blog post, I decided to interview someone else to hear their perspective on being abroad. With that being said, I interviewed my roommate, and also fellow SAI student, Shelby S. about her experiences. Tell us a little bit about yourself. Being a “quarter” student for SAI, my student abroad time ends mid-April, instead of mid-May, like many other students doing the full term. I remember looking back at my Delta Airlines app on my phone, out of curiosity, to see how many days it said until I could check in for my return flight…it said 80 some days. Now, it says 15, and I know those are going to absolutely fly by. Weekend trips! Stressful am I right? Not one week had passed when I started hearing my classmates talk about how they had every single weekend booked until May. I was in shock. I hadn’t even thought what I was going to eat for dinner that night much less what cities/countries I wanted to visit. It was sad to see how eager students were to leave Italy. After being in Florence for about a month now, there are definitely a few things I would put on a “must-do” list. First and foremost, take a cooking class. SAI has cooking classes offered throughout the semester, and they’re great, especially because you just have to put a small deposit down, and you get that back when you show up! Basically free – we all know college kids can’t pass up free. When applying for a study abroad program, I made sure to pick my dream destination, Florence, Italy. I knew coming to Florence would be an adventure in itself, and that the city would have a lot to offer. Luckily, Florence is in a great location and is surrounded by many other beautiful cities and countries. One of my favorite classes so far this semester has to hands down be my Introduction to Fashion Photography class. It’s only been a month and I’ve already learned so much that it makes me really excited to see what the rest of the semester has in store! I remember saving for months so that I could finally buy this beautiful Nikon DSLR camera with an LCD swivel screen. Traveling around Europe is something I was extremely nervous about coming into this semester. I have a terrible sense of direction, don’t speak other languages very well, and have a tendency to break down in stressful situations. It turns out those three things really don’t mix well when something goes wrong during traveling. When you think of Florence, what comes to mind is probably the architecture of Filippo Brunelleschi, the sculptures by Michelangelo Buonarroti, the incredible collections of paintings in the Uffizi Gallery and Palazzo Pitti, and important frescoes in many of the churches in the city. What we view today as historically important records of human thought made manifest in art and architecture, were in their time, contemporary. Studying abroad and becoming engulfed in another culture is such an amazing experience. On top of that, it provides an opportunity to get to see more than just your host country. Traveling while abroad can be so excited but also so stressful! I’ve compiled a list of my best tips for seamless travel abroad. 1. If you ever find yourself in Florence, you’ll see that there are thousands of places to get food. So many people make the mistake of spending their money on the tourist spots and miss out on the tastiest hidden treasures of Florence. Here are some of the tips and tricks to finding the perfect hole in the wall and authentic Florentine food—organized by category of course! Parli Inglese? Do you speak English? My first week in Florence consisted of basically three things: getting lost, getting gelato and getting a lot of Italian pronunciations wrong! I started my travels on January 23, 2017. I said goodbye to my family and boarded the first of 3 connecting flights to Florence, Italy! I had been saving my whole college career for this opportunity and I couldn’t wait to just get there already. The plane ride went surprisingly well. Last weekend, I took a trip to Napoli (Naples) with my roommates. I was very excited to go because everybody I talked to about my weekend plans got very excited for me as well! And, because Napoli is the birthplace of pizza, we received plenty of pizzeria recommendations. It was also my first time to the ocean! What I first noticed about Naples is the vibrant and youthful atmosphere. It was last June, and I was walking back from Piazzale Michelangelo on the afternoon of my twenty first birthday. It was raining, then suddenly pouring, in broad daylight, and every student on the tour seized cover under roof overhangs and storefront awnings. On the street, Italians walked unabated through the summer shower. The boys and girls got separated, and me and Pietro, our Florentine tour guide, were stuck under a leaking gutter. I have lived in Florence, Italy, for just about a month now, and I have fallen in love with all the incredible sights and activities this city has to offer. Although I cannot say I have experienced everything yet, here is a list of my 10 favorite things to do in Florence thus far. 1. Visiting Piazzale Michelangelo. Fortunately for my roommates and I, we live a very short distance from Piazzale Michelangelo. Wow, I learned a lot about myself in the short time I was able to explore the Swiss Alps. I have never felt so light and free. I am in Switzerland and peaking in life. This is the most visceral connection I have ever had to a land. If there is a god out there, please let this be my eternal resting place. The first impression I had of Florence occurred to me as I was leaving the airport upon my arrival. Right away, I noticed the similarities between the suburbs of Florence and my home country, Mexico, which I was recently in. The city’s infrastructure, streets, driving style, and buildings were very similar. Even the language, Italian, printed on murals and advertisements was almost identical to Spanish. It gave me an advantage and a feeling of comfort. Italians take pride in their food and fine wines. Whether you stumble upon tiny cafes or street restaurants, Italy is full of extraordinary and unique places to dine. While my summer abroad in Florence, I had the chance to discover some of these treasures for myself. It did not take me long to discover that the Italians truly have a way with how they choose to display food and drink. I have never worked harder for anything in my life like I did for this study abroad trip. I spent a year doing scholarship applications, working at my work-study job everyday, and helping my siblings with anything for a couple bucks. I had several departure meetings at school and interviews to prepare for this amazing trip. Preparing to go abroad is one of the most exciting times in the process, but can also be stressful and overwhelming. No matter how many blogs you read, or people you talk to, it is difficult to know just how prepared you are, and how you will adjust to your new home. I will admit, I had my fair share of meltdowns in the weeks before departing for Florence. Love to travel, but hate the stress and hassle of having to pack for a long trip? Well, flying suitcase-free to your favorite European destinations could be a thing of the future, according to the market research group Euromonitor. Have you ever gotten excited over a tiny cup of espresso?, A freshly baked croissant from your favorite secret bakery?, A lemon the size of your head?, or a 1 euro scoop of gelato? If you answered yes to any of these I think we may have a lot in common! Coming from a big city like New York I sometimes find it hard to take joy in life’s simple pleasures. I have lived in a small town in Washington State my whole life. It is a quaint little town that even people born and raised in Washington have never heard of before. I love where I am from more than anything, but being that I’ve hardly traveled outside of the United States and away from my hometown, I knew I had to go out and see the world. A Letter to Florence, Thank you. Thank you for being my home away from home. You were my little bubble of safe haven in Europe. Every weekend I traveled to another country, I would always get really excited to return to you. Thank you for never disappointing me. You provided me with so much . There was so much art, history, and culture right at my fingertips every single day. It has been a year since I have had a taste of the great Italian culture in Florence, Italy. I was fortunate enough to live there for almost four months last fall. I traveled to seven countries and countless cities across Europe. It was amazing. However, while I was traveling it never crossed my mind how difficult it would be to explain to my family how truly great all of my adventures were. After the dozens of weekend trips, studying for finals, and packing away everything from the past four months, it’s finally time to go back to the United States. It’s difficult to summarize all the amazing experiences, memories, and friends that I have made while abroad. During these past four months, I’ve experienced some of the most beautiful places and have gotten to live in a European culture. We can’t get enough of Erin Pachter’s creative video of her semester abroad. She studied with SAI in Florence Fall 2016, and visited so many beautiful places! I had previously seen a video like this on YouTube and I really enjoyed it. I knew going into my trip that I wanted to make a video like this because it would show and remind me of all the adventures I had traveling. Studying abroad as a fashion merchandising student was an amazing opportunity for me. I took a visual merchandising class during my time abroad, which is something that I could see myself doing for the rest of my life. My professor was so knowledgeable and really sparked my interest even more about the visual aspects of the fashion industry. Our class final project was called “Tell Me a Story. There was a dog I never met in Florence. He was a little guy, mostly white with some ink splotches, and he had a hard time walking. Yet his owner, upright and undeterred, would walk him down a street near mine whenever night fell. During my time attending FUA this summer, seeing that dog and his patient owner was as much a nightly routine for me as walking seemed to be for them. One of the main things that draws tourists to Florence and Italy in general is the promise of delicious food. From tiny cafés to sidewalk restaurants, Florence has so much to offer in terms of food that it can get overwhelming to decide where to go! While studying abroad in Florence, I had the opportunity to explore the streets to find my favorite places to eat for every meal. “There’s no time to be bored in a world as beautiful as this” – Unknown The best thing about studying in Florence Italy this fall is that not only am I baking my dreams come true in the kitchen but also my horizon is expanding and nothing but a growing curiosity for adventure and knowledge is left. There is so much more to experience than just classes when studying abroad! Top 10 Things to do in Florence! 1. Get Gelato My favorite thing about Italy is the amazing gelato. There are so many different little gelato shops, and they all have different flavors! Honestly, you cannot go wrong with any choice of gelato shops. There is a gelato shop where they serve you gelato and decorate it as a flower; the shop is called Amorino. 2. Eat at a local restaurant There are so many options for yummy restaurants in town! In the normal world, being lost is not a good thing; it is to be avoided at all costs. However, during your abroad experience, I would suggest you do get lost in your new city. (Of course make sure you have the right tools to find your way back home if you get really lost; I would suggest CityMaps). So it’s officially fall in Firenze! Yes that means it is COLD, oh and rainy! Okay so it’s not really that bad……. But if you plan on traveling to Florence (which I completely support), bring a good jacket and umbrella. Remember to carry your umbrella with you. If you are like me, you won’t think about your umbrella until you are soaking wet walking through Florence. Do your research! Always do your research before your trips. Look into what airport or train station you are arriving in and how far that is from where you are staying. Research the area that you are going. Research transportation from the train station to your hotel or where ever you are staying. (Some places have Uber). Now that I have been in Florence for about a month and a half, I have definitely picked out some of my favorite things to see, places to go, and things to do. I did my best to compile a list of just 10 of these to share with all of you. The following are in no specific order: 1. 1. Enjoy wine and watch the sunset at Piazzale Michelangelo. It is very touristy so my recommendation is to get there early (before the sun sets) to get a good seat. 2. Shop and watch local street entertainment at the Piazza della Repubblica. Enjoy shops from fast fashion stores like Zara to luxury shops like Gucci. There are some of the best places to enjoy dinner with an amazing view. We handed over our Instagram account to Hannah for the day. This is her day in Florence (October 12, 2016). Hello! My name is Hannah Latham and I will be taking over this account for the day to show you my typical day in Florence! I am from Grand Rapids, Michigan and am currently a junior attending Florence University of the Arts but back home I go to Carthage College in Wisconsin and study Neuroscience. Jessica takes us along as she tastes wine in Bolgheri, swims in the warm waters of the Isola del Giglio and hikes around archaeological sites on the SAI program inclusive weekend excursion to Maremma and the Tuscan Islands. ___ Jessica is a current student at Georgia State University studying at the Florence University of the Arts, Italy during the Fall 2016 term. From the moment I left the airport, I knew that the next four months were going to be full of many first foreign adventures for me. Going to Europe was the first foreign step I was taking. There were so many emotions that I was feeling as I stepped on the plane from Boston to Zurich, Switzerland and then to Florence, Italy. My first impression of Italy was OH MY GOODNESS! EVERYTHING IS SO PRETTY!! That was literally my thoughts about every building as the shuttle drove me to my apartment. Everything is so big and different, and so much prettier compared to my hometown. The Start of Everything New! You never truly know what to expect when you leave everything you know to study in a different country. A couple of weeks ago I made that leap of faith and came to Florence, Italy for a semester abroad! I have only been here for a short time but, besides the fact that I still find myself lost a majority of the time, it is starting to feel like I have been here for months! Despite my rather small sampling size of classes in Florence, I am going to break down the major differences and similarities in my experience at an art school in Florence versus an art school in America. Here in Italy I have completed Watercolor and Sketchbooking Florence, and am currently in Street Photography. First and foremost is the art of course. First and foremost, the food in Florence is finger-licking good. Jumping from dorm food, to fresh, succulent Italian cuisine, my stomach has yet to experience any symptoms of culture shock. From, a nice, affordable three course meal at Osteria de Pazzi, to greasy, late night pizza at Fo’Caccia la Notte, my tastebuds continue to be pleased. I also think it is worthy to note taste tasting gelato has been integrated into my daily routine. This semester is coming to a close and unfortunately I have to say goodbye to this city I have fallen in love with. Florence is a small city that I have been able to spend the past four months exploring and learning from. Everywhere you go is beautiful and a piece of history and sometimes it needs to have a little cleaning. It has come down to our final days here in Florence. We are saying bye to our friends, the delicious food, and the amazing city we have been able to call home for 4 months. Leaving is becoming harder everyday because I have built a life here and created memories I will never be able to experience again. When I arrived in Florence back in January, I remember being absolutely terrified. I had never left the country let alone by myself and I had never been away from home for longer than a month. I remember walking around that very first day thinking what am I doing here since everything was so foreign and different to me. Those first few weeks were very difficult to say the least. My typical day as a travel abroad student consists of usually meeting with my Italian chat pal Alessia. We practice our Italian and I help her with her English. We always get coffee, Paninis, or gelato. Sometimes I check out the events and excursion sign-up through my SAI program. –Take advantage of these! Well, what once looked like a distant possibility is now over. For many months, I was stressing about finding the perfect program, then coordinating meetings between different departments at Tufts trying to receive course credit, and finally attaining meetings with my Dean to understand my options if I couldn’t achieve said credit. This was over six months ago before I set off on my first (or maybe it’s my second) study abroad experience. There’s a really incredible charm about Florence. When I arrived the first day, I could feel it when I walked to my apartment or went to the grocery store. Everyday since, I’ve known there’s something special about Florence, but it took me a long time to figure out exactly what it was. Traveling to other cities helped my search. These past two and a half months have been the time of my life. Florence has quickly become a part of me, somewhere that I know leaving will be very difficult. These are many places I frequent in Florence. From a café, to one of the squares, I try to spend as much time as possible exploring this city that I have come to call my new home. It is crazy to think that I have been here almost three months and only have one remaining. Ciao! My name is Olivia Mendoza and I am studying at SAI in Florence. I will be taking over the Instagram today and sharing a day in my life here. I am from Los Angeles, California, but go to school in Texas at Baylor University. This is a picture taken at Giardino di Pratolino during a spur of the moment picnic with my roommate! We handed over our Instagram to a few students this month and asked them to take us through their day in their host city. This is Annalise’s day in Florence (April 6, 2016). Ciao Ciao! My name is Annalise Andriacchi and I’ll be taking you around Florence today to show you what it’s like to live “a day in the life of an SAI student”. A bit about myself: I am a junior studying Hospitality Management at the University of Missouri. We handed over our Instagram to a few students this month and asked them to take us through their day in their host city. This is Ashley’s day in Florence (March 29, 2016). Ciao! My name is Ashley Shealor, I’m from Charleston, South Carolina and a Junior at University of South Carolina, currently studying at FUA in Florence, Italy! “It’s the time of your life!! You will never want to come back to America!! You’re going to fall in love with places you’ve never been to and people you haven’t met! You are going to find yourself and this experience is going to change your life!” These are some of the things former study abroad students tell you about going abroad…. Am I right? My journey getting to Florence was a long, hauled out, highly anticipated journey. When I told my study abroad counselor 1 year ago I wanted to study abroad in Florence during the spring semester, he told me I was too early and to come back in the fall semester when applications actually opened. I have known since the beginning of college that I wanted to come to Italy. Just as there are some differences between the states of Wisconsin and New York there are tons of differences between countries like Florence and the United States. Whether I love the differences or can barely stand them I have to embrace every second of it because there is no changing culture and to rebel would be rude, look silly, and would be a waste of time. We handed over our Instagram to a few students this month and asked them to take us through their day in their host city. This is Noah’s day in Florence (March 14, 2016). Good morning! My name is Noah and today I will taking over the SAI Instagram to show you what my day is like in Florence! This is the view from my front door. After months of anticipation and planning, January 25th 2016 finally came around, the day I left for my study abroad experience in Florence, Italy. Looking back at the day I left and my travel here I would say the hardest part was saying goodbyes to family and friends in person. Home Sweet Home? Home Sweet Home! Dear Mom, It’s already been about two weeks since I arrived in Florence and a lot has happened. I’ve met new roommates; I’ve changed my diet (quite a bit of pasta and pizza); I’ve walked more than I ever imagined; and I’ve started new classes to name a few things. Throughout, there have been the ups and the downs. These are Crucial, Believe Me. I am going to give you some insight into the 10 things I learned my first week studying abroad. Before I came abroad I thought people were over exaggerating experiences and information, but boy was I wrong. So if you are thinking about going abroad here are some things I picked up really quickly. 1. You walk… A LOT. Am I Allowed to Stay Forever? I’ve only been in Florence for a week and I already want to live here for the rest of my life. The people, the city, and the lifestyle, all of it is wonderful! From the first day of living in this bustling city, I’ve noticed some very obvious cultural differences both great and a somewhat strange. 1. My journey to Florence, Italy, started on Monday, January 25th. Because I had never been to an airport, I was a little nervous to embark on the trip all alone. Luckily, I met a girl named Ellen, who was in the same program and going to the same place I was. We met up at the gate to board and all my nerves were calmed. Through all the big things you feel like you have to do while abroad… here are 5 small things you should do… Going abroad is a big deal and can be stressful as well as fun. When I think of Italy, all I imagine is the amazing pasta, bruschetta, pizza, gelato, and wine that are consumed daily. When friends and family heard I would be studying abroad in the heart of Italy – Florence – they would all coo about the mouth-watering food. After living in Florence for 4. 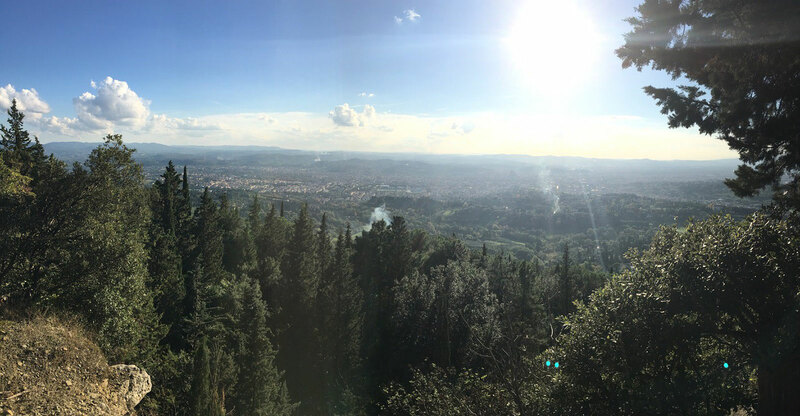 Perhaps the happiest and most alive I have ever felt was when I would go on bike rides to Fiesole. There were all of these fliers that SAI had provided my roommates and me with in our apartment. One of them was for Tuscany Cycle where one could rent bikes, go on bike tours, and Vespa tours through the Tuscan hillside and Chianti. I went one day early on in my semester abroad. THE MUSEUMS 1. The Uffizi Gallery: An amazing art collection established in 1581. Get lost among the masterpieces of the Renaissance and Baroque. 2. Galleria dell’Accademia: Originally intended to be a Michelangelo museum, the Accademia is now home to the original David, along with several other of the artist’s works. The museum also boasts a large collection of Gothic and Renaissance paintings. 3. Palazzo Vecchio: The seat of the Florentine government since its construction in the 14th century. I’ve undergone more changes and matured faster in the past 4 months than in the past 4 years in college. Yes, that’s a very bold statement, but it’s true. Coming to Florence was a huge breath of fresh air. I was initially so happy to be out of my hometown, Bethesda, which was quite homogenous and filled with type A, semi-pretentious and ambitious liberals. Taylor was selected as an SAI scholarship recipient and blogger for the Spring 2016 term. She is a current student at Washington State University studying at Florence University of the Arts in Italy, during the Spring 2016 term. 10 FUN FACTS ABOUT TAYLOR 1. I am scuba certified through NAUI. 2. I have bottle fed twin calves for a month (their names were Greg and Bridget). 3. I was president of my sorority Kappa Kappa Gamma as a sophomore. 4. Jenica was selected as an SAI scholarship recipient and blogger for the Spring 2016 term. She is a current student at Colorado State University studying at Florence University of the Arts in Italy, during the Spring 2016 term. 10 FUN FACTS ABOUT JENICA I love anything related to food. Cooking it, eating it, learning about it, I’d say food occupies my mind most of the day. I believe God has a purpose for each and every one of us (Romans 8:28). Noah was selected as an SAI scholarship recipient and blogger for the Spring 2016 term. He is a current student at Tufts University studying at Florence University of the Arts in Italy, during the Spring 2016 term. 10 FUN FACTS ABOUT NOAH I love going on adventures, whether that’s hiking up a ravine and skiing with my family (see the picture) or finding one-of-a-kind pizza places with my friends. I love skiing and surfing, baseball and soccer, and golf. Melissa was selected as an SAI scholarship recipient and blogger for the Spring 2016 term. She is a current student at St. Norbert College studying at John Cabot University in Rome, Italy, during the Spring 2016 term. 10 FUN FACTS ABOUT MELISSA 1. I am from a small town in Wisconsin 2. I am left-handed 3. I have been to Zambia and South Africa for a humanitarian trip 4. I used to work at Lambeau Field 5. Studying abroad, a story of how a man became a boy….Just kidding, it’s not that deep, these are the 12 things that I learned while studying abroad. 1. Experiencing a variety of cultures makes me ask more questions about the world. Did you know that the United States is not the center of the universe? If you would have asked me this question three months ago my head would’ve exploded in disbelief. 2. Sheena was selected as an SAI scholarship recipient and blogger for the Spring 2016 term. She is a current student at Carroll University studying at Florence University of the Arts in Florence, Italy during the Spring 2016 term. 10 FUN FACTS ABOUT SHEENA 1. I have never seen an airplane up close nor the ocean. 2. I dislike wearing socks and prefer to go barefoot. 3. I danced for 13 years. 4. The smell of sandalwood is wonderful. As we wrap up the end of the fall semester, I am feeling so much jealousy for all of you who are getting ready to study abroad in Florence in the spring. Don’t worry, I’m also really excited for you, but I remember this time last year, getting ready, packing, getting my visa figured out. It’s a lot, but it’s absolutely worth it. Hylen was selected as an SAI scholarship recipient and blogger for the Spring 2016 term. She is a current student at Washington State University studying at Florence University of the Arts in Florence, Italy during the Spring 2016 term. 10 FUN FACTS ABOUT HYLEN I value my family and friends highly and dear to my heart, I would do anything for them. It wasn’t until after I came home from fall break did I feel like Florence was my home. Before leaving for break I didn’t feel as if the city was a part of me yet, or if there was really anything about it that would ever rail me back in later on in life. 7 Essential Tips for the BEST Fall Break! I made the slightly stupid but still courageous decision to plan my own Fall break with my roommate and another friend. It’s a great experience; it forces you to plan the details and rely on yourself (plus other students going with you). 1. Do NOT book overnight travel— (past 1 am – before 6 am). Europe doesn’t operate that smoothly after hours, especially not Italy. Olivia was selected as an SAI scholarship recipient and blogger for the Spring 2016 term. She is a current student at Baylor University studying at Florence University of the Arts (FUA) in Florence, Italy during the Spring 2016 term. 10 FUN FACTS ABOUT OLIVIA 1. I am a Junior Speech Pathology major at Baylor University, which I absolutely love. A passion of mine is working with special needs children, which I hope to do after I graduate. 2. 1. Remember your goals Why did you choose to come to this country? What were you looking to discover? I find it helpful to continually remind myself of my original goals. Are there any goals that you have yet to complete? Each day, you are able to make the choice to work towards them. “The bad news is time flies. The good news is you’re the pilot.” – Michael Altshuler 2.